Twitter is a great social media platform. but how to use it effectively so that it can help you to increase traffic. Today we are going to discuss how you can use twitter to increase traffic for your blog for better customer relationship and how to enforce your followers to create engagement. With the below tips you will be able to set up a great communication with your followers with the effective use of twitter. You will be able to increase your brand awareness, to create communication with your new visitors and to increase your followers so get ready. It is very easy to create market research on twitter and how to do that I will tell you, first you can ask your customer about the purchasing behavior than about their interest and you can also ask about how and what they think about your product. If they are using your products, they will be definitely following you on Twitter so that they can get the latest information. You can ask about their interest as well so all these methods will make you able to gain the rear and valuable customer feedback which later will help you to improve your business. Ask about their purchasing behaviour. A website gains people trust when it provides a good customer service. If you are a regular blogger then you can also provide good customer services the way you provider comments on your post. The similar thing that you have to do is by answering peoples query on twitter, you can also monitors all the conversations that is going on about your business, you can view negative comments and convince the others and when a follower notices that you are responding him very quick then he will definitely click on the link that you share. So this can be a great way to bring traffic for your blog as well along with building trust and readership for your blog . Send thank you message if they retweet your tweets. Notice negative comments about your business and convince others. how to make your website popular it is very essential to create relationship with your followers on twitter you need to make them realize that you have a closer connection with them and for this purpose you can do this following things first you need to re tweet there tweets so that they may be thankful to you in a game if they re tweet to your tweets than you need to give them thanks messages and you can also create a meaningful conversations with them this well make them realize that you take care about their tweets as well. Make them realize that you wish to co-operate with them. Without a strategy you will not be able to think that what you have to do tomorrow and that will result into the poor customer feedback because without a strategy you will not be fully active on twitter and your less activity will result in lack of re-tweets on your tweets and lack of traffic for your blog so without strategy you cannot win this game. So create a plan where you will mention what you have to do in this entire month also notes down when you will tweet and also note down at what time you will tweet and what type of information you will share with your followers so this is combined called strategy and if you continue it for the month then you will see miraculous results for your blog. Make a perfect time table for month. Write at what time you will tweet. How many times you will tweet. What type of information you will share. Be consistenty and regularly conduct your actions according to plan. So these were all the tips for using twitter which will result into better customer relationships, heavy customer engagement, re-tweets on your tweets and in the end traffic for your blog that you really want and this is the reason that you are using twitter. 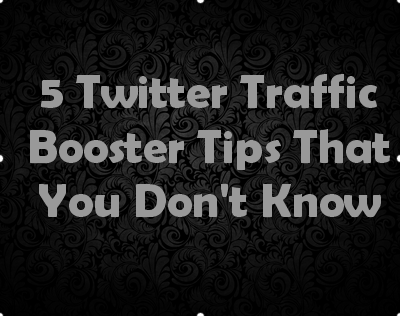 Description : 5 twitter tips to increase traffic that you don't know. This works like booster and create engagement and get more retweets on your tweets.